This raises the (in-universe) question of why does the Kree suit even have colour changing functionality in the first place if all Kree are green? Only the Kree we see have a green colour scheme, but Kree who perform other functions have different colors? There are opposing political factions within the Kree that are designated by colour? Out of universe I know it makes it easy for the audience to recognize the change. A big benefit of being able to change your colours on the fly would be so that you can camouflage yourself into your surroundings. We don't see them do this in the film, if I remember correctly, but they didn't really need to. It makes for a massive advantage over the enemy to be able to seamlessly adapt to your surroundings. Remember that Yon-Rogg's squad seem to be quite an elite unit, considering the mission we see them go on so it would make sense they have access to some pretty cool tech. The idea was that, "As they go on missions, they can change their color on the fly, for camouflage reasons," explained Park. BuzzFeed, 21 Secrets About The "Captain Marvel" Costumes That Will Make You Say, "Wait, That's Really Cool"
Other Kree do wear different colours. Whilst the official reason appears to be for camouflage as explained above I think it's worth noting that we do see other Kree wearing other colours. 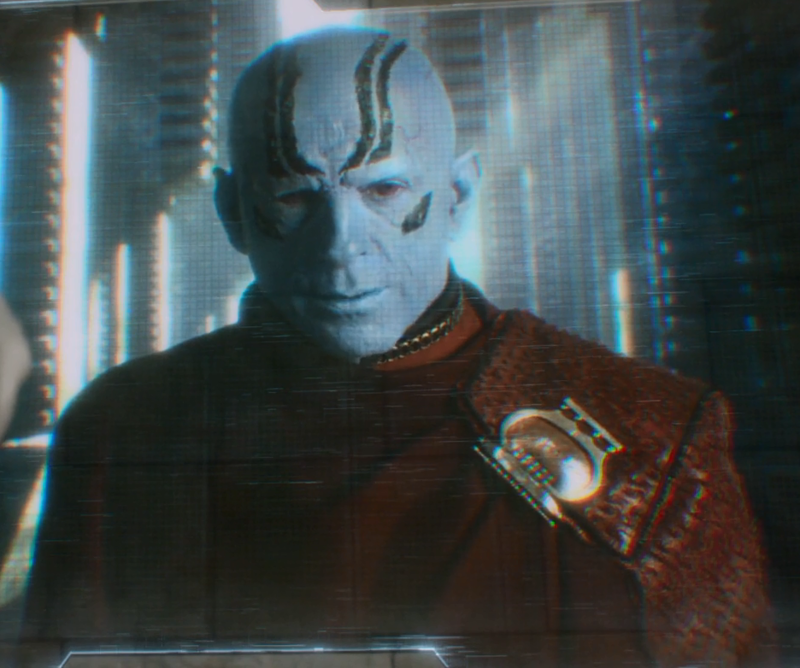 In Guardians of the Galaxy we see the Kree Ambassador wearing a red uniform. Whilst this could be more of a formal outfit than the green uniforms of the Starforce members we see in Captain Marvel it does show they don't restrict themselves to just the green. 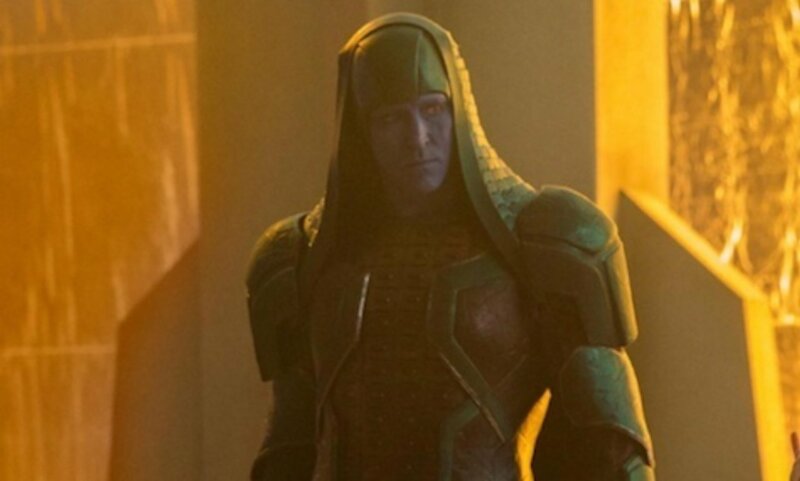 In Guardians of the Galaxy we also see an older version of Ronan and at this point he has changed to it being all black rather black with the green highlights we see in Captain Marvel and it does look like the same outfit. Whilst it's possible this is because he has "gone rogue" it could be down to him moving into a different position within the Kree Empire. And to clarify on my comment in the linked answer, it would still hold true as she is switching sides from the Kree and Yon-Rogg's unit and we see only see their unit with the green colouring. This raises the (In-Universe) question of why does the Kree suit even have coloring changing functionality in the first place if all Kree are green? Camouflage is the most likely answer - the ability to blend in to different environments and societal norms (e.g., not just urban vs. woodland, but Kree city clothing vs. Xandar city clothing, etc.) The cut is obviously going to differ from local norm, but if the color scheme is right, it'll pass a cursory look. These Warrior Heroes are operating out and about on a regular basis, and it makes sense for them to be adaptable. The fact that we never see them take advantage of this capability during Captain Marvel makes it hard to substantiate this (or any) theory. Why were the colours of Wolverine's costume yellow and blue? Can the Abomination change back and forth? Why does Captain America's costume change in all the movies? Why couldn't Peter take off the space suit? Can Spider-Man change the color of his webbing?